Very happy new year to you. I'm planning to have a really good one myself. After a period of hibernation and much thought, I've decided to stick with my 125 for now. I just haven't yet found the next perfect bike so I'll be waiting for a bit longer. Quite frankly, I'm fed up of looking and I want to get on with my plans. I'm particularly waiting on the 2015 models of everything to see if manufacturers have come up with anything which remotely suggests that they're listening to consumers. I know there's no such thing as the perfect bike (is there?) but I want something darn near close. In the meantime, I'll be making some modifications to my 125 to make it more comfortable for riding. 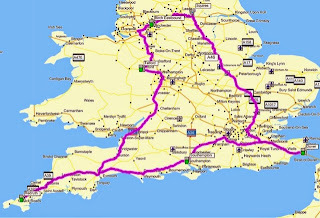 I've got two major rides planned this year so far which should cover most of the areas in the UK I'd like to tour: Wales, Scotland, coastal England, and Ireland. I may get Northern Ireland in, too, while up in Scotland. 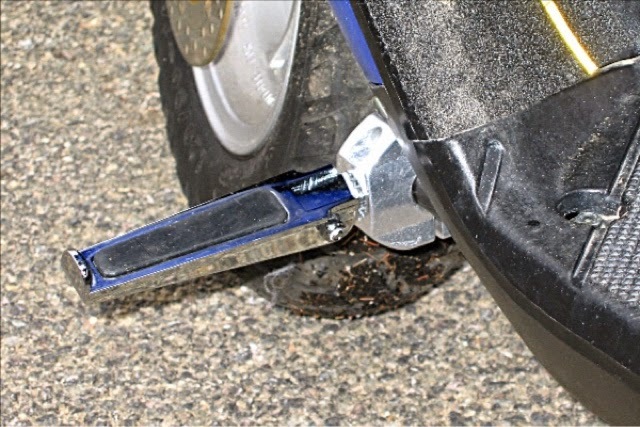 So, I'm looking at installing some footpegs which will allow me the option to ride with legs outstretched. This is one of the top bonuses on a Burgman. Also of importance is a rider backrest. I'm looking at various options and will most likely settle for a rolltype seat bag which doubles as a rider backrest. And that's it! Nothing else to add. Fill up with fuel and cruise along in comfort. I'll keep you posted of each installation as and when. Ciao! Thanks for the tip! Very worth looking in to... and doable, too! WElcome back to the world of blogging. I hope you were able to get in some riding over the last month. The perfect bike is the one that you feel the most comfortable with. I like scooters because of the ease of operation. I had a 125 (Yamaha Zuma) which was a good bike but as my needs changed it occurred to me that the bike didn't fit those needs. The Burgman 400 did and in a lot of ways still is my favorite bike do to storage. But it was heavy, under powered and didn't get great gas mileage. My Kymco Exciting 500 is faster, lighter and more like a traditional bike in handling plus gets but offers little storage. So ask yourself what your needs are, what your wants are and find something that meets most of those desires. There is nothing wrong with riding a 125cc, except it makes a harder to overtake a lorry, however, you will likely find a lot side road attractions when taking the slow way over secondary roads. Believe me, when we rode our little Vespas (250/300cc) all the way down to Italy, it certainly took longer, but we had a blast. Wishing you many miles and smiles.